Makani offers high-performance, easy-to-use and technically innovative solutions for next-generation wide-area services. Makani Mobilizer™ appliances are deployed in the customer's network for blazing-speed data access over a wide-range of access networks. Makani Enhancers™ are deployed for wide-area network ("WAN") optimization and application acceleration. 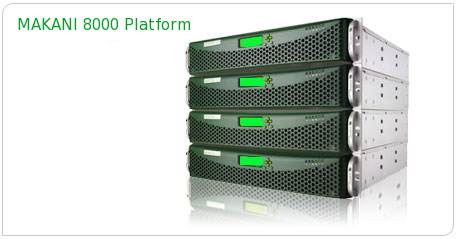 The Makani appliance can be deployed as a hardware, software, or a virtual appliance. To deploy the Makani solution in your network, you need at least one Mobilizer or two Enhancer appliances. For performance and fault tolerance, customers can deploy load-balanced clusters of as many Mobilizer and Enhancer appliances as their scale, access, and bandwidth requirements dictate. Makani Mobilizer: The Makani Mobilizer transparently optimizes and accelerates data over wide-area access networks. The Makani Mobilizer is available either as single-point solution or (optional) dual-point product models. Makani Enhancers: These are high-performance Makani appliances that optimize and accelerate wide-area data. Atleast two Enhancers are required for deployment.